It’s my first time at TORRENT CYCLE. What should I bring? Welcome to TORRENT CYCLE! You should wear comfortable, close fitting workout clothes (we recommend tights or shorts and your favorite workout tank or tee). We provide cycling shoes free of charge (our bikes require cycling shoes), or feel free to bring your own - our bikes are compatible with both LOOK Delta and SPD clips. We have hair ties and ear plugs available at the front desk. Yes. All riders must create an account on our website, which includes accepting our terms and conditions waiver. Do you have water, or should I bring my own? We have a purified filtered water fountain if you want to bring your own water bottle. Otherwise, you can purchase SmartWater at the front desk for $2. Yes. We have lockers with keyless locks so you can store all of your belongings during class. 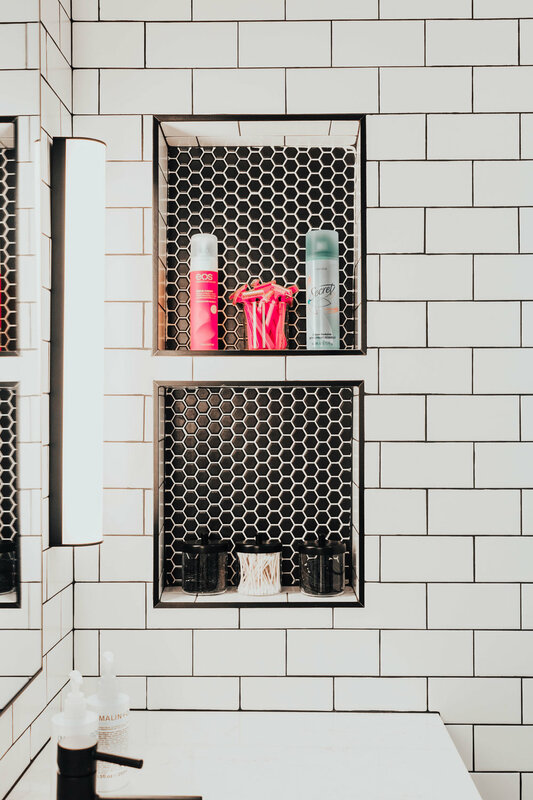 We also have separate women's and men’s changing rooms with showers, towels, and just about every amenity you can imagine to get ready (including shampoo, conditioner, body wash, face wash, body lotion, hair dryers, flat irons, razors, shaving cream, deodorant, cotton swabs, and more!). We are proud to offer (MALIN+GOETZ) products in our showers and bathrooms. Get ready to pamper yourself after class! We are located at 252 Broadway (300 South) in downtown Salt Lake City, UT. We have free parking in the lot behind our studio. First, create an account on our website. Once you have created an account, you can purchase class series or memberships on our BUY SERIES page. After you purchase a class series, use our SCHEDULE page to find the class you want and book your exact bike in the class. When does the class schedule go live for reservations? Weekly schedules go live Mondays at noon. The booking window is from Tuesday through the following Monday. Check out our SCHEDULE page to plan your next class. Classes must be cancelled 12 hours before the scheduled start of class or your credit will be forfeited. Classes can be cancelled on our website or by calling the studio. I’m on the waitlist. How will I know if I make it into class? If a scheduled guest cancels more than 12 hours before the scheduled start of class and if you are the next guest on the waitlist, then you will be automatically assigned a bike for class and you will receive notification via email. If a scheduled guest cancels less than 12 hours before the scheduled start of class, we will reach out to you via email or phone to confirm if you would still like to be added to class; you will have 1 hour to reply before we extend the same offer to the next guest on the waitlist. If you do not hear from us, you can still show up for class and there is a very high chance that you can get into class! If guests do not show up more than 5 minutes before the scheduled start of class, then we will begin to assign their bikes to guests on the waitlist in chronological order. Call the studio. We need to know you are on your way so that we don’t give your bike to someone on the waitlist. If you call to let us know you will be late, we will hold your bike up to 5 minutes after the class start time. No one will be admitted into class more than 5 minutes after the scheduled start time. Yes. You can purchase digital gift cards on our website on the BUY SERIES page. Both digital and physical gift cards can be purchased in the studio. Gift cards can then be used to redeem class series or merchandise. Do you offer student, teacher, or military discounts? Yes, we are proud to say we do! Please call the studio or drop by to learn more about our discounts for students, teachers, and active military families. We recommend riders be at least 16 years old, and we do not permit children under the age of 13 to ride at TORRENT CYCLE. All riders under the age of 18 years must be accompanied by an adult or present a signed liability waiver at your first class if you will not be accompanied by an adult. Our Stages bikes can fit riders between 4’10” and 6’10” in height. Yes! However, each woman’s pregnancy is different and we highly recommend you check with your doctor prior to joining us for any classes. This varies based on each individual and the intensity of their ride. Research supports that you can expect to burn between 500 and 700 calories in a 45-minute class. Yes! If you are riding 20 or more times per month, the best deal is our monthly membership. Pricing details can be found on our BUY SERIES page. The membership requires a 2-month commitment and auto-renews each month. In addition, a 30-day cancellation notice is required to terminate the membership.